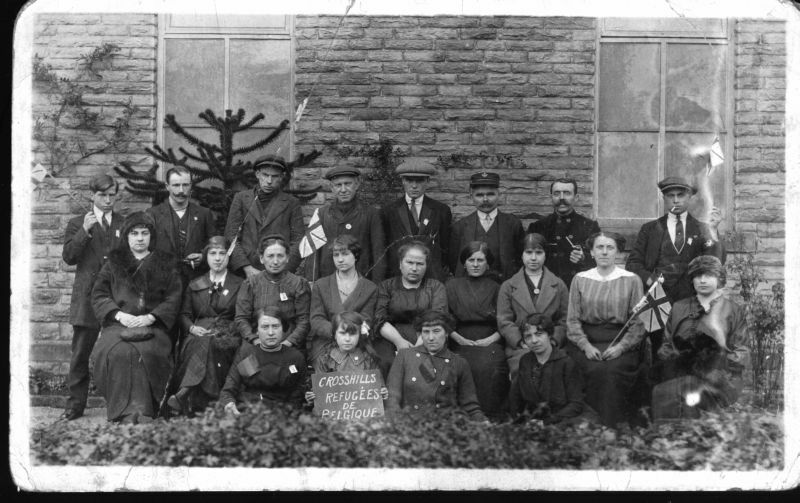 With thanks to Joan Tindale and Tony Ingham who provided the scans of the same photograph, and Dr John Laycock for the scan of the second batch of refugees. Highlighted on the forum by Denis Pickles, the booklet "Sutton-in-Craven C. P. School. 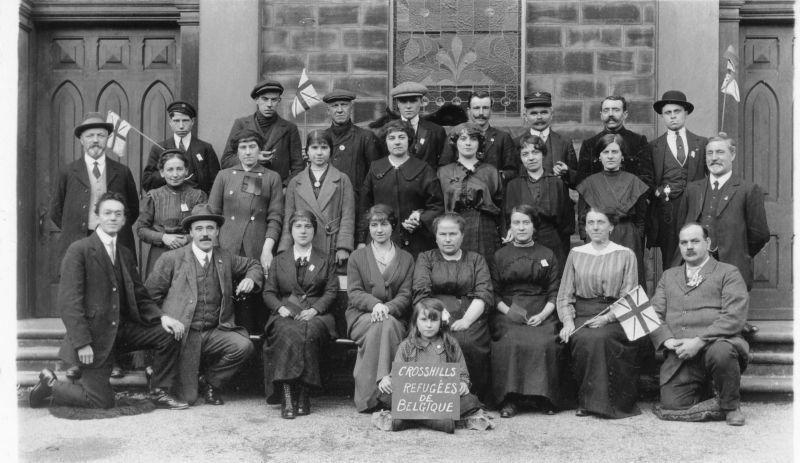 A History in Words and Pictures 1873 -1996" makes reference to the fact that by October 1914 "over 40 Belgian refugees were now living in the district". The photographs were taken in St John's and Ebenezer chapel yards Cross Hills. The following image, probably taken on the same day, is from the Glyn Whiteoak collection. 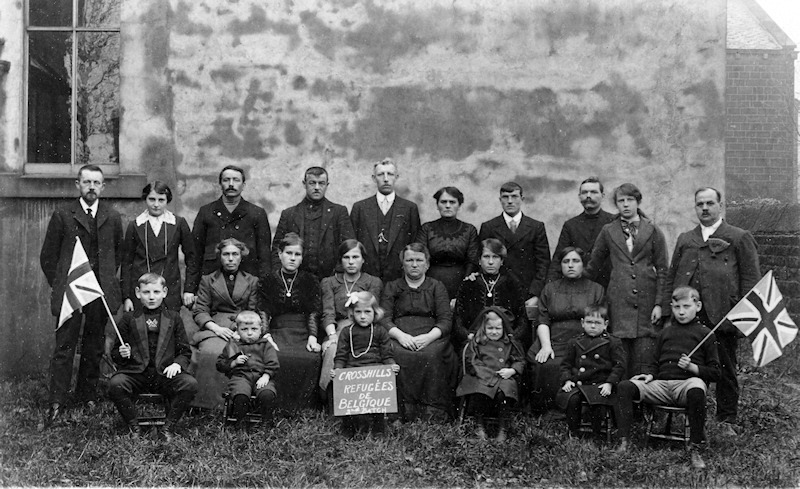 Dr John Laycock provided this image of the second batch of refugees. An interesting personality, Commodore Pierre de la Rue was interred at Sutton Parish Church on Wednesday week, at the age of 77. He came from Ostend, and had been living in Sutton for about seven months. He was a member of a seafaring family and himself went to sea when 11 years old, and for 40 years was a ship's master for the same firm. At the age of 18 years he was a pilot on the River Congo. 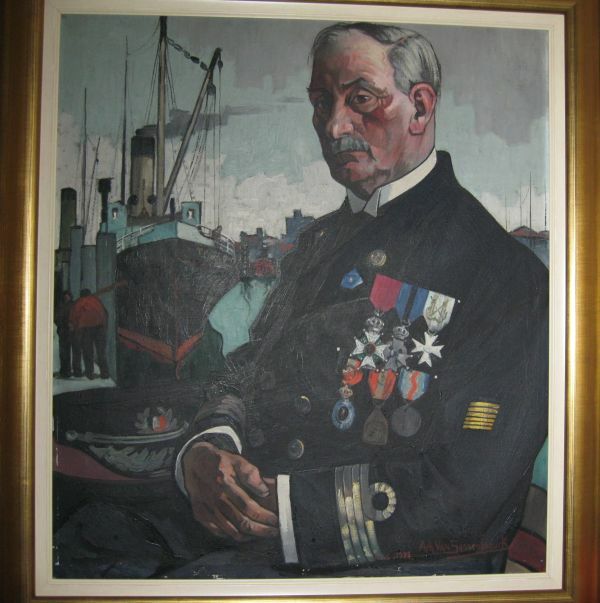 He continued at sea until 67 years of age, when he retired from active service. He had three sons, all seafaring men and all skippers. One was Pedro de la Rue, who lost his life in June 1941 when his ship was torpedoed on its way from West Africa. His widow has been living in Sutton with other members of her family, who came from Belgium in the early days of the war. The other sons of the Commodore are Julien and his younger son Andre. The funeral service was at St. Joseph's Roman Catholic Church, Crosshills, and was taken by Father Vermiere, a Belgian priest from Dewsbury, assisted by Father Malone. The committal was in the graveyard at Sutton Parish Church. One of the men who was on the beaches on D-Day, on Thursday paid a visit to the grave of his father who had been interred in the Sutton Churchyard the previous week. The visitor was Capt. Julien De La Rue who has family associations with the village where he stayed at the house of his sister-in-law, Madam Pedro De La Rue, one of a party of Belgian refugees who found a home at Manor Hall, Sutton-in-Craven during the last war, when she herself was a young lady. Capt. de la Rue was one of the first to approach the shore in his little Belgian boat "Marcel". He brought his ship, loaded with petrol, to a point less than a mile from shore. The cargo was got off safely, with German shells and bombs dropping all around and Nazi snipers ashore putting up as hail of small arms fire. The "Marcel" returned to Britain for more cargo and then she returned to the French coast. With hatches open, her crew of 14 helped to unload the spirit. "It was a miracle that nothing hit us. If it had, we should have been for it� was the skipper�s only comment. As Capt. de la Rue said, these little ships will have a big story in themselves when it can be told."